This is one of the simplest fossils ever: a cylindrical hole drilled into a hard substrate like a skeleton or rock. The above image is of a hardground (cemented carbonate seafloor) from the Upper Ordovician of northern Kentucky with these borings cut perpendicularly to the bedding and descending downwards. Each boring is filled with light-colored dolomite crystals. 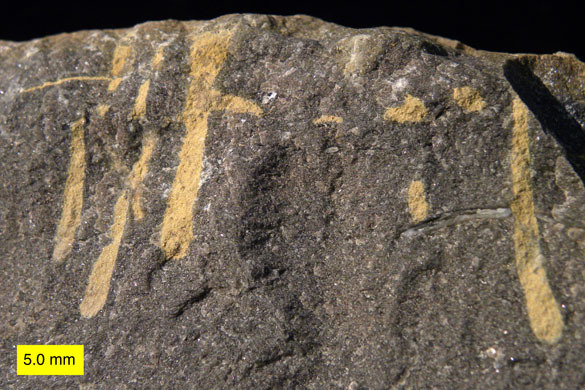 This boring type is given the trace fossil name Trypanites weisi Magdefrau 1932. 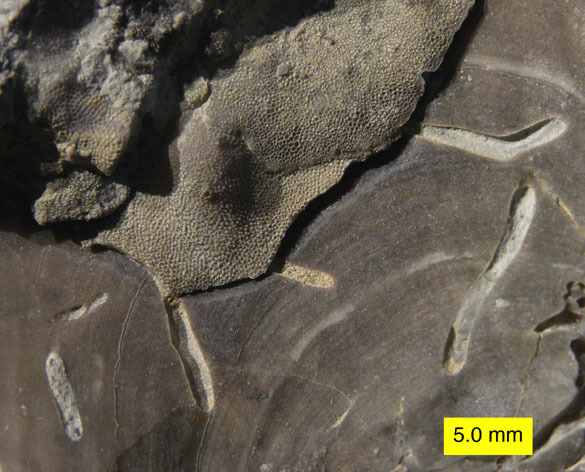 Trypanites, shown above cutting into a trepostome bryozoan from the Upper Ordovician of southeastern Indiana, is a very long-ranging trace fossil. It first appears in the Lower Cambrian and it is still formed today — a range of 540 million years (James et al., 1977; Taylor and Wilson, 2003). 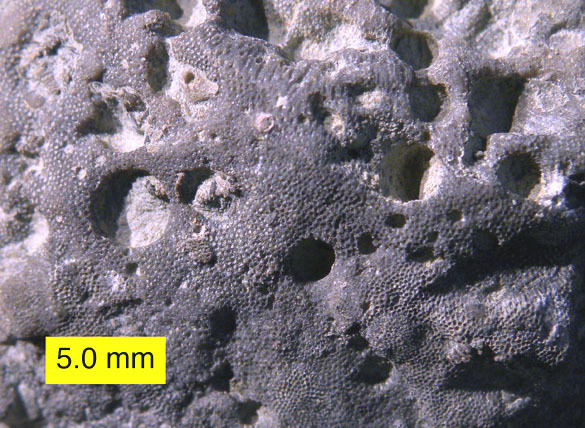 It was (and is) made by a variety of worm-like organisms, almost always in carbonate substrates. Today the most common producers of Trypanites are some polychaete and sipunculid worms. Trypanites was the most common boring until the Jurassic, when it was overtaken in abundance by bivalve and sponge borings. Trypanites was the primary boring in the Ordovician Bioerosion Revolution (Wilson and Palmer, 2006). Trypanites is defined as a cylindrical, unbranched boring in a hard substrate (such as a rock or shell) with a length up to 50 times its width (Bromley, 1972). The typical Trypanites is only a few millimeters long, but some are known to be up to 12 centimeters in length (Cole and Palmer, 1999). The above occurrence of Trypanites is one of my favorites. 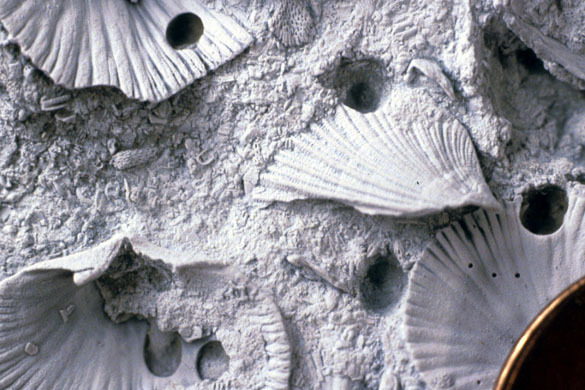 The organisms bored into a bryozoan colony (the fossil in the upper left and center with tiny holes) and down into a bivalve shell the bryozoan had encrusted. The borer then turned 90° and drilled horizontally through the aragonitic and calcitic layers of the shell. The aragonite dissolved, revealing the half-borings of Trypanites. In this bedding plane view, Trypanites weisi borings are shown cutting into a hardground from the Liberty Formation (Upper Ordovician) of southeastern Indiana. This is a significant occurrence because the borings are cutting through brachiopod shells cemented into the hardground surface. When the brachiopods are dislodged from the hardground, those with holes in them erroneously appear to have been bored by predators (see Wilson and Palmer, 2001). The simplest of fossils turns out to have its own levels of complexity! Cole, A.R. and Palmer, T.J. 1999. Middle Jurassic worm borings, and a new giant ichnospecies of Trypanites from the Bajocian/Dinantian unconformity, southern England. Proceedings of the Geologists’ Association 110 (3): 203–209. James, N.P., Kobluk, D.R. and Pemberton, S.G. 1977. The oldest macroborers: Lower Cambrian of Labrador. Science 197 (4307): 980–983. Wilson, M.A. and Palmer, T.J. 2001. Domiciles, not predatory borings: a simpler explanation of the holes in Ordovician shells analyzed by Kaplan and Baumiller, 2000. Palaios 16: 524-525.